Delarosa is at this point a neighborhood institution in the Marina. The place looks like a European chain bistro, so it’s not exactly a classic California vibe. But what is classic SF are the hordes of people waiting around for an outdoor table on nice days and off the clock tech workers throwing back drinks inside. Outside, you’ll find puppies, strollers, and the humans who own them spending their time watch-judging the other stroller moms during the day and the drunk people passing by at night. Suffice it to say, Delarosa is pretty much always “happening.” The food, while not quite up to the initial greatness from its opening days back in 2009, is reliable enough to keep us coming back on the regular, and sometimes we are even rendered silent when eating something that involves burrata. Dishes comes out very, very quickly, and if anything, the service can be a little bit “Hurry the eff up and order because the drunk girls waiting for this table are getting feisty.” But the place has a fun energy and generally lively bar scene that’s worth experiencing - or at least observing. 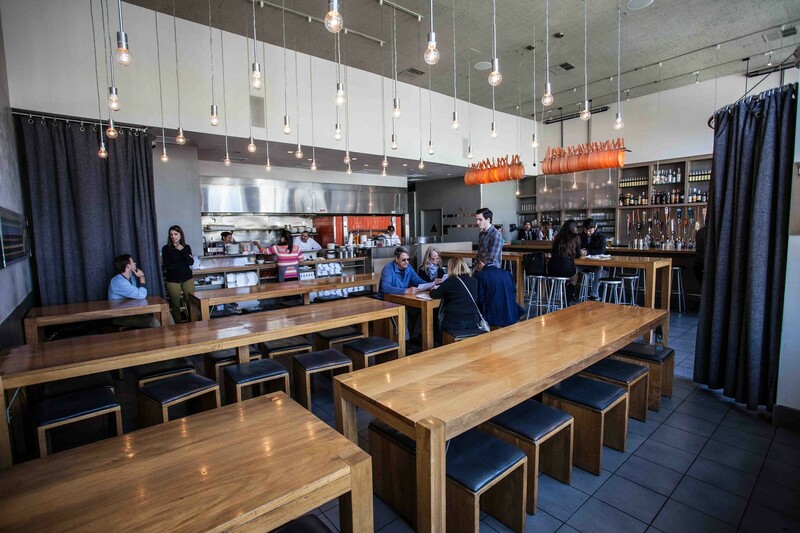 Tall communal tables run down the front of the restaurant, while lower benches and two-tops fill out the back. None of them are comfortable, so back we are with those Euro bistro vibes. This, and the typical thirty minute minimum wait, help explain the Serious Take Out Operation status of Delarosa. And best of all, you can still get a good slice of the Chestnut Street biota when you run in to grab your stuff to go. Blah. Not enough dressing or massaging of kale so its super chewy. The burrata comes topped with hazelnuts and honey, which is a chance to eat some sweets pre-dessert. You should appreciate this. Interesting flavors and fantastic cheese. Baseball-sized meatballs, tender and spicy if a little on the dense side. Good. Generous on the bean puree and the pecorino, these are awesome. Not Italian for spiders. Weren’t you paying attention to Muzzy? Spiedini are skewers, and Delarosa dedicates a whole menu header to the three options. Unfortunately, none of them are very good. The meat and veggies tend to be a little dry and lacking in flavor. The burrata is amazing, and the crust is thin and does the trick, but can get a little soggy. Just have to eat faster. Generous on all the toppings. Always in the rotation. You know what else is very San Francisco these days? Feeling like you’re an insider at an exclusive club. We’re looking at you, Battery. Anyways, we’ll gladly share this off-the-menu pizza tip: order the Bartender’s Special. Red sauce, sausage, olives and spicy peppers. Meaty delight.